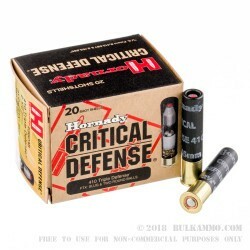 Designed for use in the Taurus Judge, this unique .410 gauge shot shell load from Hornady's Critical Defense line fires a slug that engages with the gun's rifling, followed by two lead balls. 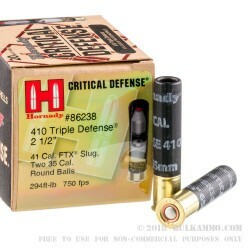 The slug uses Hornady's Flex Tip to provide expansion, while the balls use high antimony lead for penetrative effect. The projectile column leaves the muzzle at a velocity of 750 feet per second. 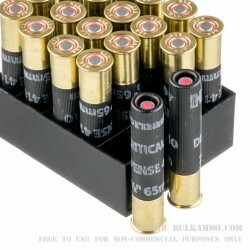 The .410 Critical Defense load is designed to strike a man-sized target at a range of 7 yards. Each box contains 20 shotshells. Hornady of Grand Island, Nebraska is a well-known manufacturer of premium bullets and a frequent supplier to other ammunition makers. Founded in 1949, the company entered the loaded ammo market in the 1990s and quickly established itself as a major player with top quality product lines such as Critical Defense, Custom, Critical Duty, and the humorously named Zombie Max. The company's innovations also include the .17 HMR (Hornady Magnum Rimfire), a popular high performance rimfire cartridge. The best 410 load going! Q: Can these be used with a Taurus Judge Pistol 3" Chamber? A: Yes, these 2 1/2" shells will function correctly in your Judge chambered for the 3" variation of this caliber. 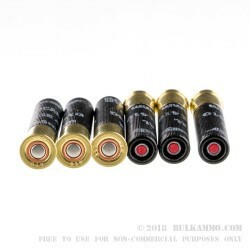 This round includes a 41 caliber Hornady FTX slug along with two 35 caliber pellets.